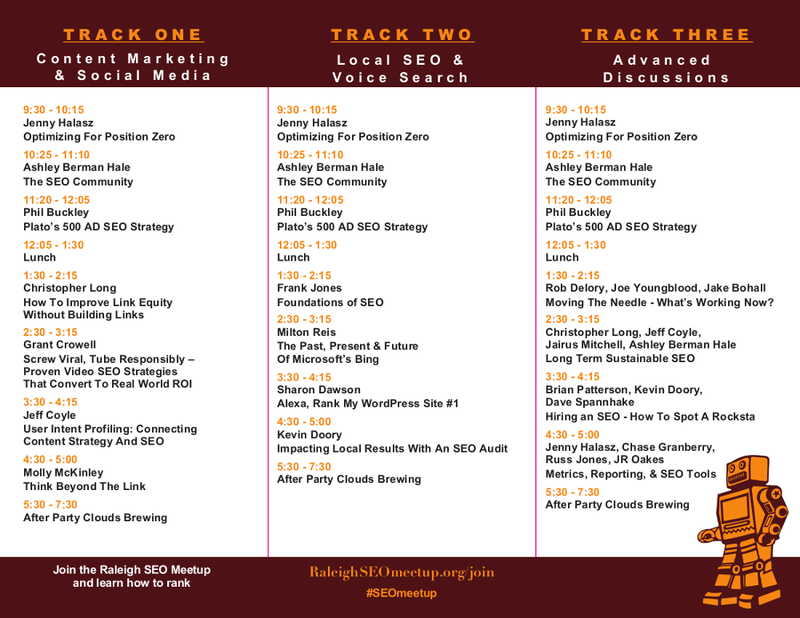 The Raleigh SEO Conference has three tracks covering content marketing, social media, local SEO, voice search, and advanced panel discussions with industry experts. From beginners to online marketing pros, you will learn something new at this event. Social media and content marketing are about the same thing, content! Writing new posts for your blog or Twitter feed and taking pictures for your website or Instagram are very related. If you want to learn more about getting the most from your content marketing and social media efforts, this is the track for you. This track is great for beginners and intermediate marketers. Since the goal is getting to the very top of search results, local SEO and voice search seem very similar. Voice search is all about optimizing for position zero, and local SEO focuses on putting your business at the top of map results. In both cases, you don't just want to be on the first page of search results - you need to be the very first result. If you are just getting started or still have a lot of questions, beginners and intermediate marketers will enjoy this track. So you think you have SEO figured out and there is nothing more to learn?! This track is designed for the online marketing experts that just want to dive into the most advanced topics. Each panel is filled with senior marketers and agency owners. The sessions are guided by audience questions with the expectation to take a deep dive into the topic. Bring your notepad and pen because you will come away with a wealth of knowledge, and some new terms to research further. If you are not an expert, plan to have more questions than answers in this track.